Congested Beijing is building fresh airport capacity that will see it become the world's largest aviation hub, leaving London - currently the world's busiest system of airports - and even ambitious Dubai in its wake. Beijing's new airport at Daxing south of the city could have up to nine runways and ultimate capacity to handle around 370,000 passengers per day, or a staggering 135 million passengers p/a. This would increase capacity at Beijing area airports to around 220 million p/a - almost a quarter of a billion passengers. London's Heathrow, Stansted, Gatwick, Southend and City airports handled 147 million passengers last year, well ahead of New York's 103.6 million (JFK, Newark and LaGuardia). Tokyo's Narita and Haneda was the third busiest airport system last year with a combined 98 million passengers, followed by Paris and Chicago. Beijing's new airport will enable the nation's capital to keep up with rapid growth in demand, in line with the nation’s fast growing economy. The facility will ease pressures on Beijing Capital International Airport (BCIA), now the world’s second busiest airport after Atlanta, which is nearing its ultimate capacity of 85 million passengers. BCIA, which opened its Terminal 3 project only three years ago, handled 73.9 million passengers in 2010, up 13.1% year-on-year. Terminal 3 is the world’s largest airport building, with more space than all five terminals at London Heathrow combined. Beijing Capital became the world’s second busiest airport last year and is now closing the gap to Atlanta, which handled 89.3 million passengers in 2010 (+1.5%). In reaching the number two spot, Beijing Capital leapfrogged London Heathrow, which has also dropped below Chicago O’Hare. Beijing was 14th globally as recently as five years ago with 41 million passengers, a figure now matched by airports in both Guangzhou and Shanghai. Construction on Beijing Daxing is likely to commence late in 2011, a year later than originally anticipated, with total investment estimated of at least USD15 billion (CNY100 billion). The new airport, which is part of the government’s new Five-Year Plan announced earlier this year, will be constructed on a 21 sq mile (54 sqkm) site in Daxing. To put this in perspective, the site will be the same size as Bermuda and almost twice the size of Macau SAR. With nine runways (reported to include one military and eight civilian runways), the new airport will have the largest number of runways in the world. Denver International Airport currently leads the list with seven. The new airport, which will be located 30 miles south of Beijing, is likely to exclusively handle burgeoning domestic and cargo traffic. BCIA is expected to lose many of its domestic services, which could pose significant operational and cost issues for airlines based in Beijing. So far this year, domestic passengers have outnumbered international four-to-one at Beijing Capital. Beijing's 12th Five-Year Plan also calls for "connecting roads and matching services" for the new airport. Beijing is also set to announce several more high-speed rail lines to service both the Daxing and Capital airports, with links also expected to Tianjin, Shenyang, Shijiazhuang and Shanghai from both. This is in addition to the existing Beijing-Tianjin line and a new Beijing-Shanghai rail service that will open later this year. Other plans include extending Beijing’s subway system to 600 kms, up from the current 561 kms. Construction on the runways and facilities at the new airport will commence before the end of 2011. The initial focus will be on land acquisition (the area is predominantly used for farming) and site clearing for a new airport. "The suggested location is a place with few residents and buildings, so a lot of runways can be built," said Wang Jian, the secretary general of the China Civil Airport Association. The new facility is expected to serve not only Beijing, but also the two neighbouring cities and provinces of Tianjin and Hebei provinces. Daxing will become Beijing’s third airport after BCIA and the semi-military Nanyuan Airport, which is also expanding. In Dec-2010, authorities noted the airport is expected to invest more than CNY200 million (USD30 million) in its expansion project to compliment Beijing Capital prior to the opening of Daxing. Upon completion, Nanyuan will have more than 20 civil aprons, up from 14 at present. Beijing Municipal Government first revealed plans to construct a new airport in the city in 2002, with the opening originally expected ahead of the 2008 Beijing Olympics. However, it opted to expand Beijing Capital International Airport instead, as the site selection became a politically-charged issue. Based on current capacity data from Innovata, Beijing Capital is the second largest airport in terms of system seats, with 2.0 million weekly seats, behind Atlanta Hartsfield-Jackson with 2.1 million weekly seats. 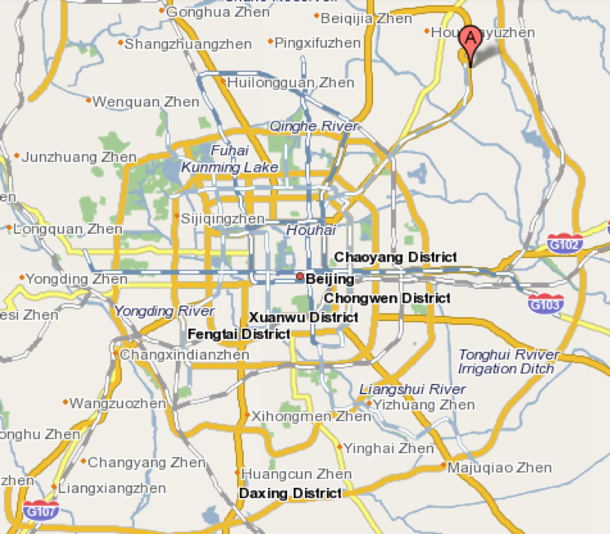 Beijing Capital was the ninth largest in terms of total capacity (ASKs) and the sixth largest in terms of frequencies. CAAC plans to invest USD8.3 billion (CNY55 billion) on the construction of 11 airports around the country in 2011. Between 2006 and 2010, 33 airports underwent expansion, while 33 new airports were constructed, increasing airports in China to 175 at the end of 2010. Investment in aviation infrastructure during the nation’s 11th Five-Year Plan (ended 2010) totalled (USD37.9 billion). The new Beijing project is part of a huge expansion of China's aviation industry, which will see the number of airports in the country increase from 175 to 230 over the next five years. The building boom is occurring not only at the nation’s largest airport, but also in secondary cities. China has over 100 cities with populations over one million and will have twice that number in a decade, highlighting the continued need to develop airport infrastructure to match the expected increase in air passenger traffic in coming years and decades. A new 212,000sqm terminal 2 (T2) building opened on 19-Jul-2011 and construction work on its second runway project has also commenced. The 212,000 sqm T2 facility is six times larger than its terminal 1 (T1) facility. Sichuan Provincial Government in Sep-2011 stated it plans to invest CNY3000 million (USD469 million) to expedite the construction of Chengdu Airport’s second runway and Terminal 2 projects as part of plans to transform Chengdu into the nation’s fourth largest aviation hub. Phase four of the airport’s expansion project could start at the end of this year. The CNY26 billion (USD4 billion) project is expected to be completed and commence operations in 2015, when it will be able to handle A380 equipment. Once completed, Chongqing Airport is expected to have capacity for 45 million passengers, 1.1 million tonnes of cargo and 373,000 aircraft movements p/a by 2020. Construction work on phase three of the airport’s new terminal project has been completed. Once completed, the airport will be able to accommodate between 16 million to 20 million passenger throughput p/a over the next five to 10 years. Fuzhou Airport’s expansion project has been included in China’s 12th Five-Year development plan. Guangzhou is constructing a second terminal. The airport is also expanding the number of runways at the airport from two to five. Construction work on the airport’s expansion project is expected to be completed on 31-Dec-2012. Construction work on the project commenced on 29-Sep-2010. By 2020, the airport will have capacity for 15.5 million passengers, 220,000 tonnes of cargo and 146,000 aircraft movements p/a. Haikou Meilan Airport’s new international terminal building project is scheduled for completion at the end of this year. The project is part of the Hainan Provincial Government’s plan to expand Haikou and Sanya Airport. Under the Government’s expansion plans for Haikou Airport, the airport is expected to have capacity for 30 million passenger numbers p/a by 2020, with hopes of transforming the airport into an international hub airport for the Southeast Asia region. Currently conducting the Terminal 3 project. The project is part of airport management’s plans to upgrade and expand the airport. Upon its completion by the end of 2012, the airport is expected to be able to handle 25.6 million passengers, 500,000 tonnes of cargo and 260,000 flights annually. The airport handled approximately 17 million passengers in 2010. CAAC in Jun-2011 approved the airport’s expansion project. The CNY3472 million (USD526 million) project includes extending the airport’s runway to 3600m. Once completed, the airport’s capacity will increase to 15 million passengers and 175,000 tonnes of cargo p/a by 2020. Airport expansion project is expected to be completed and commence operations in 2012. Expected to be unveiled in early 2012. Upon opening, the airport will have two 4000m runways and a partially solar powered 400,000sqm terminal capable of handling up to 27 million passengers p/a. Terminal 2 facility commenced operations on 23-May-2011. The 96,600sqm facility has a 3400m runway, 51 aprons, 24 gates and has capacity for 1.2 million passengers p/a. Nanjing Airport’s phase two expansion project is estimated to cost CNY9.9 billion (USD1.5 billion) and take four years to complete. Currently undertaking location selection project. The airport is planning to gain approval for its second runway project before the end of this year and commence construction work on the project in Jun-2012 with the facility commencing operations at the end of 2014. Once completed, the airport will have capacity for 25 million passengers and 420,000 tonnes of cargo by 2020. Shanghai Airport Authority in May-2011 unveiled plans to construct a fourth and fifth runway at Shanghai Pudong. Both runways are expected to be completed before 2015. The airport may also construct a third terminal. CAAC in Jun-2011 approved the airport’s CNY5691 million (USD862 million) phase two expansion project, which has received approval from the National Development and Reform Commission. Once completed, the airport’s capacity will increase to 25 million passengers and 1.7 million tonnes of cargo p/a. Completed construction work on the airport’s terminal 2 expansion earlier this year. The airport’s three terminals will have capacity for 16.4 million passenger throughput by 2015. The airport will undertake an expansion to include two new runways. Construction work on its CNY14.6 billion (USD2.3 billion) terminal three project is progressing well, as per reports in Sep-2011. Also part of the project is the construction of a four-level integrated transport hub, which is expected to cost CNY2690 million (USD420.3 million) and take three years to complete. Constructing a new T4 terminal, with its passenger throughput expected to reach 20 million p/a. Construction is expected to be complete in 2013. Terminal 4 will then serve domestic passengers. Xiamen’s new airport will be constructed on reclaimed land near Dadeng Island in Xiang’an District. The airport has been listed in a national plan and is expected to be a regional aviation hub by 2019. The airport will cover an area of 250,000sqm and is expected to have four runways by 2040 with capacity to handle large aircraft including the A380. By 2019, Xiang’an International Airport will open two runways after a six-year construction. Four runways will be constructed at the airport. Long-term traffic targets for the airport include 45 million passengers p/a by 2030 and 70-75 million passenger throughput by 2040. Plans to extend the new Terminal 3 within weeks of its Mar-2012 opening. The airport’s second runway pavement project commenced construction work on 07-May-2010. The project is part of the airport’s CNY9.8 billion (USD1.4 billion) phase two expansion project, which is a focus of the Shaanxi Provincial Government’s 11th Five-Year development plan. The project is scheduled to be completed at the end of 2011 and commence operations in 1H2012. Construction work on CNY250 million (USD38.5 million) expansion project has increased the airport capacity to 1.5 million passengers p/a. Construction work on the project commenced in Apr-2009. Construction work on the airport’s phase two expansion project is expected to commence in 2011 and be complete by 2013. NB: Chinese Government is considering construction of several airports, similar in size to Beijing, Shanghai and Guangzhou airports, in the nation’s developing Central and South region. Under China’s 12th Five-Year development plan, China plans to expand Guangzhou, Nanjing, Changsha and Haikou airports, and is considering constructing new airports in Chengdu, Qingdao and Xiamen.